When a door is first manufactured, it is given a color and protective coating - this is the initial FINISHING process associated with a new door. 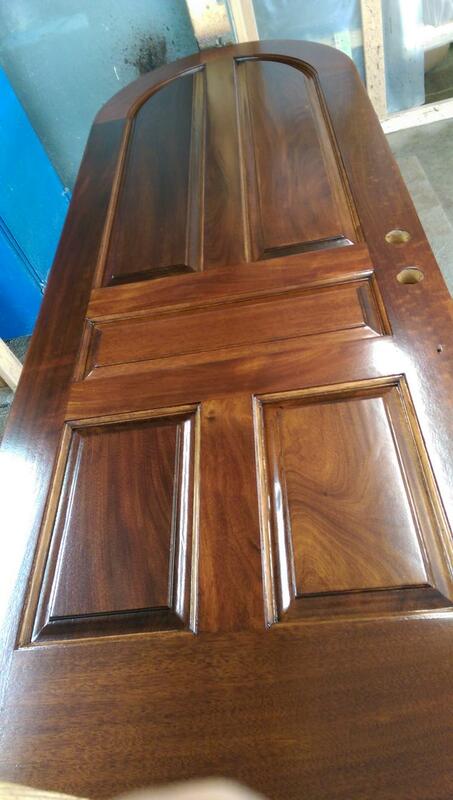 When the door is aged, this initial Finish must be removed and replaced with a NEW FINISH - this is the REFINISHING process and is more complex than the original finishing process but is necessary to preserve the integrity of the door system. 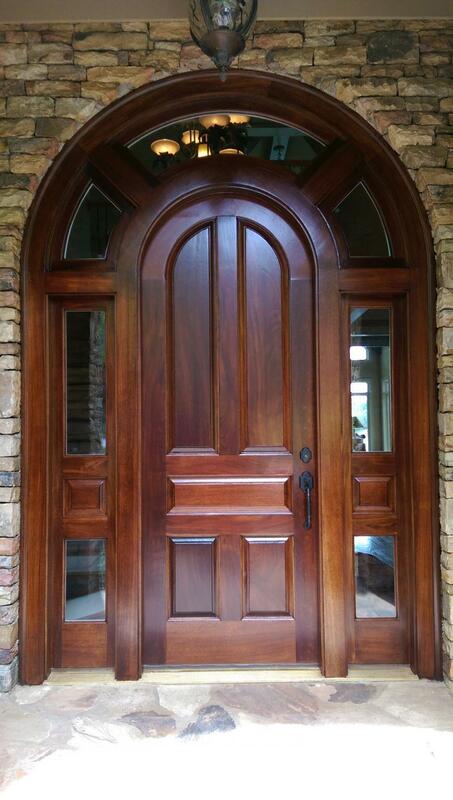 At Excalibur Refinishing we use only the highest quality materials for our doors. Minwax products are used to stain our doors and is protected by multiple coats of Helmsman Spar Urethane, a clear protective finish which is proven for this application, designed specifically to provide resistance to UV light and moisture degradation experienced by exterior doors. Assessment of the situation on site and preparation of a price and service proposal for the potential client. We would normall only refinish the exterior as the interior does not weather. It the interior requires work, this can be accomodated for an additional charge. This visit is FREE OF CHARGE, regardless of the outcome. At this point in time we usually ask the client to identify STAIN COLOR and FINISH. If the service terms are agreeable, we will remove the door(s) and take it to our workshop for processing. To the surprise of many clients, we are able to do this at the time of assessment - or else we agree a date for this. We work to our clients' schedules, not our own. The Door(s) are replaced, temporarily, with a fixed plywood insert, making sure this is weathertight and, of course the security alarm is engaged. The Door(s) are transported to the workshop on a custom built transport, designed to manage sensitive glass inserts safely. Door HARDWARE is left with the client, who have the oppportunity to replace with new if needed - we will advise on selection criteria at this time also. In the workshop, refinishing begins with removal of the old sweep, masking any glass panels then chemical stripping of all old varnish. For a successful outcome this all has to be removed. This is done by hand so as not to damage the complex profiles in most of these doors. 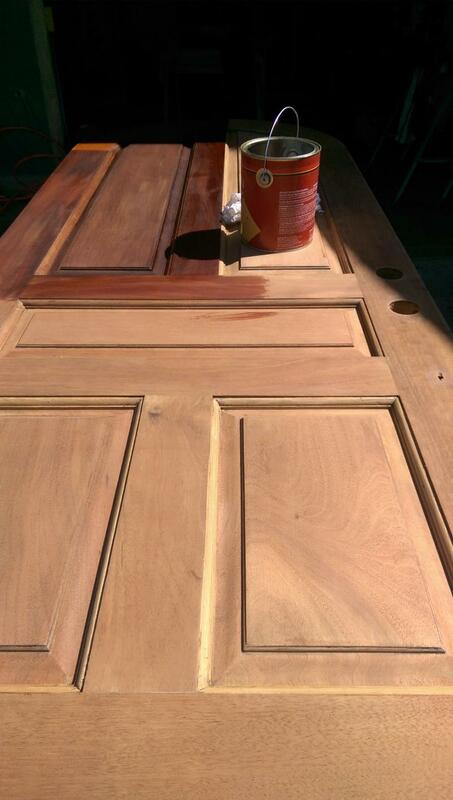 This is a very laborious process and often requires 3 or four strips if the door has had multiple prior coats. The door is allowed to dry once stripping is completed. This is also the point at which any minor repairs are made to the door. Sanding of the whole door surface. Again, this is done manually in order to preserve the profile of the door features. 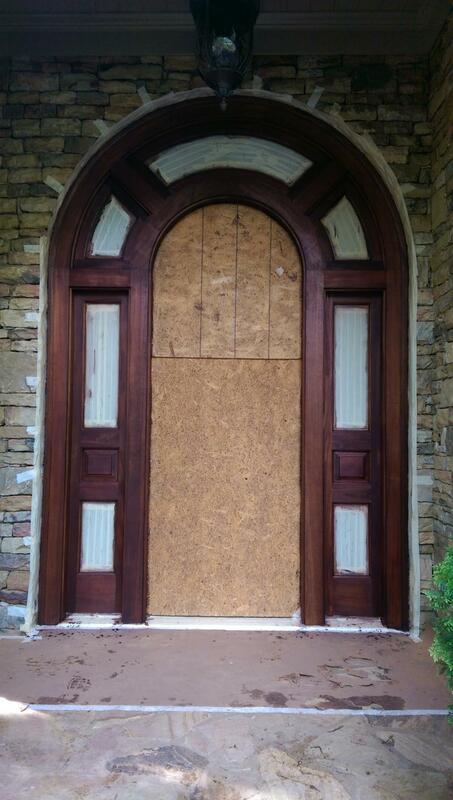 The goal here is to get the door back down to clean, new wood whih will accept stain correctly. This step has to be done meticulously to eliminate surface scratches which can mar the final outcome. Conditioning. We apply a conditioning product to the surface, designe to improve the stain consistency and to cleanse the surface of any residual dust. Staining. The choice of Stain color is made by the client. Stain is applied liberally to the surface and after a brief period, excess is removed. This is the first time the true character of the wood grain begins to show. The stained door is allowed to rest before the next step. Varnish application. We apply multiple coats of Spar Urethane varnish with UV additives designed specifically to protect wood. This is the premium protective product available today. We apply in our custom modified spray booth to achieve clean, consistent finish. Coats need time to dry between application. After the 2nd coat we also sand the surface gently with fine sandpaper to improve the qualty of the final finish. Application of varnish further enhances the beauty of the wood grain. Preparation for return to client. The masking is removed from the glass which is cleaned. 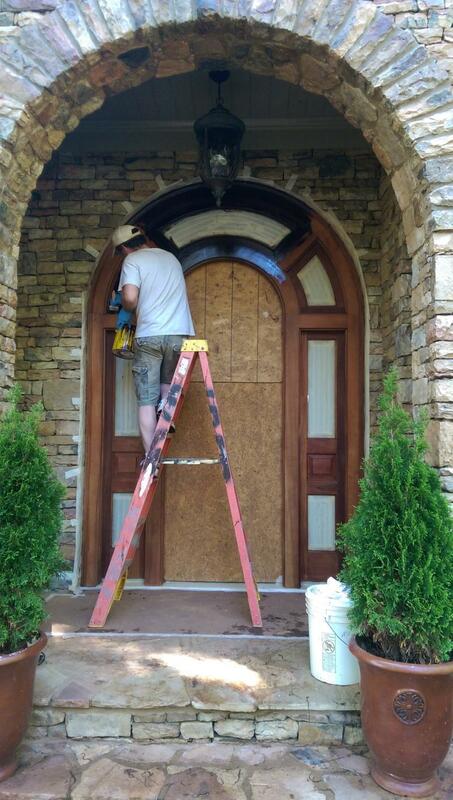 For most doors, we attach a new SWEEP on the bottom to ensure proper weatherproofing after installation. At this point the client will have been notified of status and reinstallation time/date established. Reinstallation. 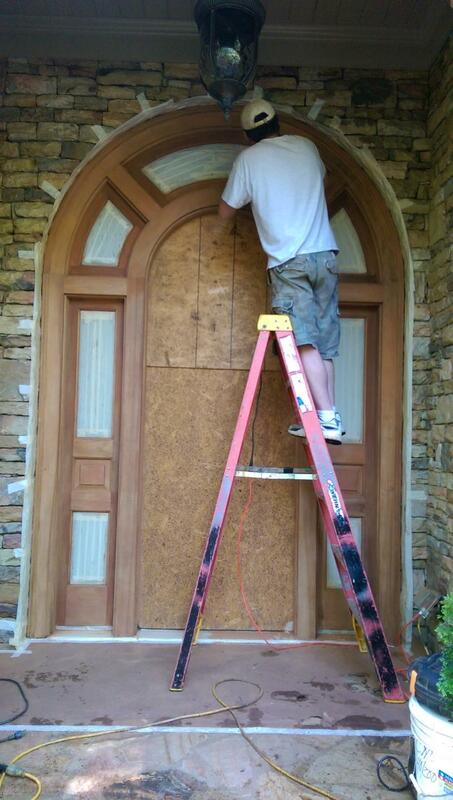 The door is returned to the client where we remove the temporary plywood and rehang the door. Door Hardware is reinstalled (with new if the client requires this) along with reinstallation of the Q-Lon weatherstripping. This is usually replaced with new. 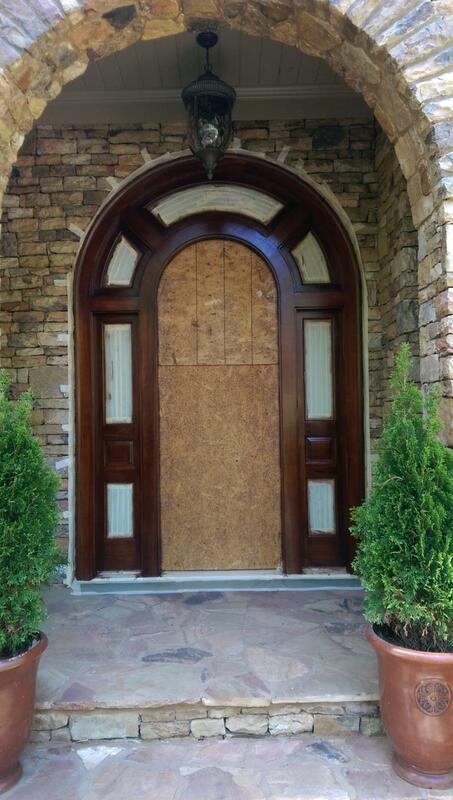 Once finished we will re-adjust the door to insure it fits properly and opens, closes, locks and unlocks properly. Of course, we also clean up before leaving. 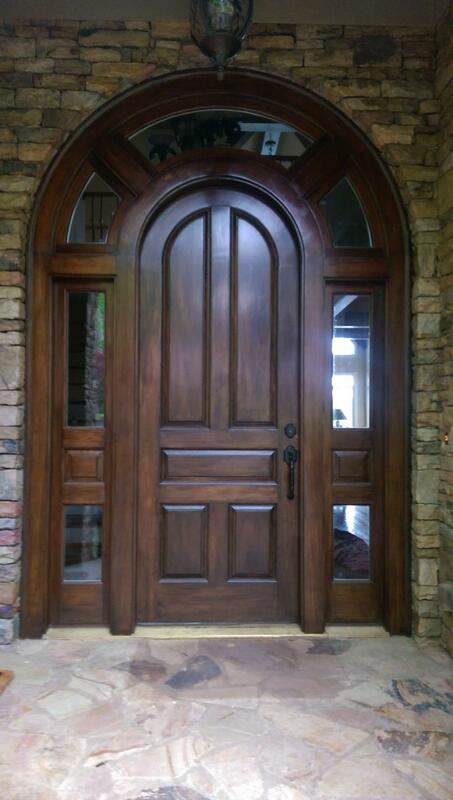 Some doors have side lights and transom which also require the same procedures to match the door. These are Extra's and have to be worked on, ON SITE. They are masked, stripped, sanded, conditions and hand-varnished the same as the main door but this requires multiple on-site visits to complete. This work is done outside and does not require the client to be home - all they will see will be masking tape and proressive development of the final product. Above: Original Entryway befor refinishing commences. 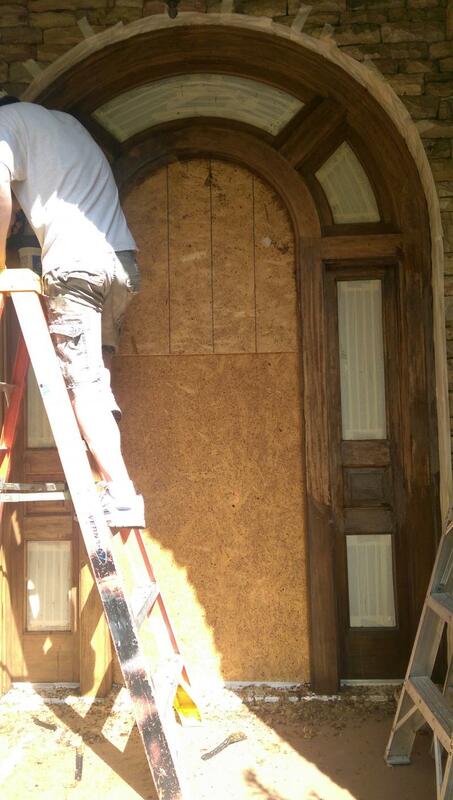 Above: Door is removed and the entryway secured with plywood. Alarm is set. The area is prepared for onsite work so the glass and surrounds are masked ahead of the stripping process. Above: The old finish is removed manualy by chemically stripping. This is a tedious and messy business but everything must be removed in order to get back to raw wood for the new finish. Above: After stripping, the whole surface must be sanded to achieve a smooth base for staining. Small repairs to cracks etc. are undertaken at this step also. This is done manually for the most part, especially where there are complex profiles. Above: The wood has recieved a conditioner and is now having stain applied to the surface. This is brushed on then excess wiped off . The stained surface is allowed to rest before varnish is applied. The stain has been applied but no varnish yet! Exterior clear varnish has now been applied. This seals and protects and lets the character of the wood stand out. Next steps we go to the workshop to look at the door itself. Above: In the workshop, the door is stripped of its finish. As you can see this is a messy business but necessary for the new finish to take well. The stripper is removed along with the varnish. 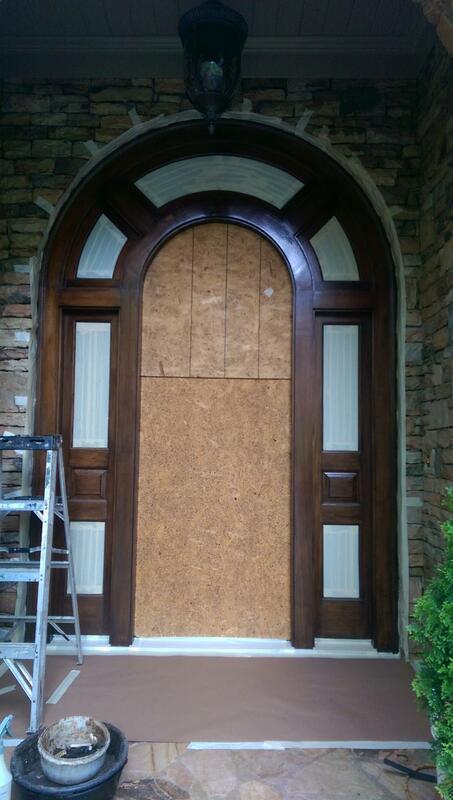 Above: The whole door has been sanded to remove any remnant of its former finish. 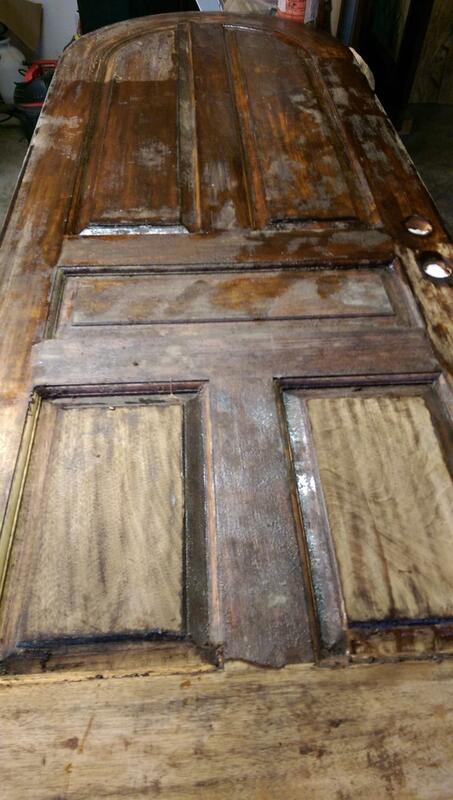 Blemishes are removed and repairs completed, the door now receives a pre-stain conditioner followed by the stain which is brushed on then excess removed, as we did with the surround. The doorhas now been stained and the exterior varnish applied in our customised spray booth. This surface will get a light sanding and a further application of varnish before it is reunited with the entryway. Above: The door has been re-hung after installation of a new weatherproofing sweep on its base. Fresh weatherstrip is optionally inserted around the kerf in the door jamb to seal the door when closed. All masking material removed, windows and the surround are cleaned. Door hardware is reinstalled or replaced as an option. Any final adjustments to the door are made to insure it opens, closes and locks properly - all part of the service.